Connection ID is your unique number of your Monflo session. It is used to connect Client devices to your PC computer. The users who connect using Connection ID have the same access level as the users who are connected by invitation. To learn how to invite users check “How to create Monflo invitations for other users” tutorial. 1. Where to find Connection ID? ...and after logging, displayed on the right side at the top. If you want to invite a user, who does not want to create Monflo Account you must give him the Connection ID. And, of course, the person need to install Monflo Client application. You can copy this number to the clipboard by clicking on it. The person to whom you send your Connection ID can connect even without creating an account. The user just have to click "Use without account" button on the logging screen. Every time you try to connect a user through the Connection ID you must approve (or reject) such a connection. 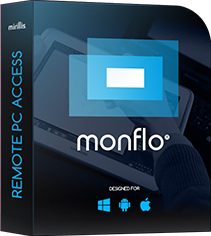 A user who is logged into Monflo Client application with Monflo Account can connect to PC computer using the Connection ID. May do so by clicking Connect using ID on the right side above the list of devices.